One of the oldest Kite festivals will continue in 2014. This kite-festival has a rich history. 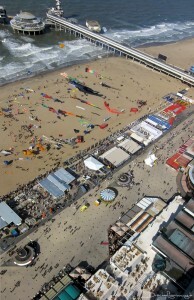 The place of the festival is also very special, the most commercial and crowded beach of the Netherlands. this involves easy 100.000 visitors during a sunny day. Enjoy this special festival on THE kite-beach of the Netherlands.